From whatever I have been able to observe up to this time the series of strata which form the visible crust of the earth appear to me classified in four general and successive orders. These four orders can be conceived to be four very large strata, as they really are, so that wherever they are exposed, they are disposed one above the other, always in the same order. So far as I have been able to observe thus far, the series of strata which compose the earth’s visible crust, seem to me to be divided into four general or successive, orders, without taking into consideration the sea. These four orders can be thought of as being four enormous strata ... which, wherever they are found, are seen to be placed one above the other, in a consistently uniform manner. 'Lettere Seconda ... sopra varie sue Osservazioni fatti in diverse parti del Territorio di Vicenza, ad altrove, appartenenti alIa Teoria terrestre, ed alIa Mineralogia') Nuova Raccolta di Opuscoli Scientificie Filologici, 1760,6,158, trans. Ezio Vaccari. Lecture at the Royal Dublin Society, 6 Feb 1914. Published in Science Progress, Vol. 9, 37. Republished in The Birth-Time of the World and Other Scientific Essays, (1915), 4. 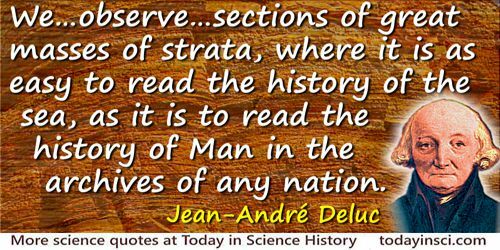 We may observe in some of the abrupt grounds we meet with, sections of great masses of strata, where it is as easy to read the history of the sea, as it is to read the history of Man in the archives of any nation. 'Geological Letters, Addressed to Professor Blumenbach, Letter 2', The British Critic, 1794, 226.